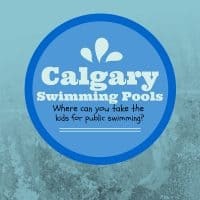 We’ve been exploring all the best places in Calgary for ice cream this summer so we can give you guys a comprehensive list of what Calgary has to offer. Also, because ice cream is delicious. 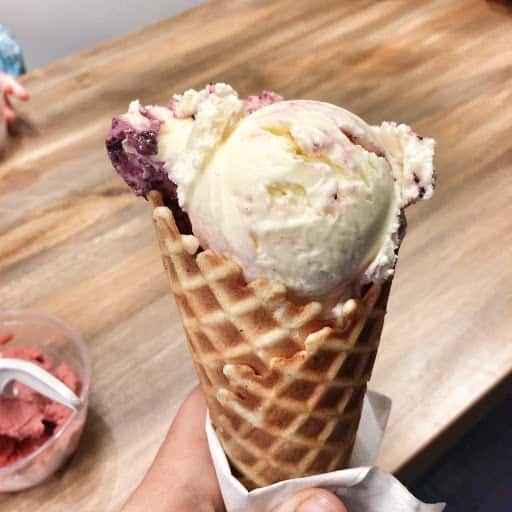 I also have a list of some of the great ice cream options in Alberta (in the Southern/central region) outside of Calgary. 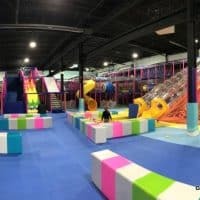 The list below doesn’t include larger chains although there are some great ones in Calgary including Marble Slab, Dairy Queen and the Rocky Mountain Chocolate Factory. I’ve noted which places have special diet options so you don’t end up disappointed when you get there. 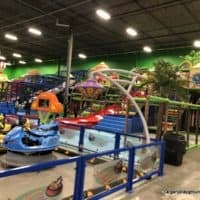 We’ve managed to go to many of the places on the list so you can get full reviews by clicking on the title link. If you are interested in non-dairy options you should also check out this post. Serves Japanese taiyaki, waffle cakes in the shape of a fish, (but you can also get a regular cone or a bowl) with red bean or nutella coating the inside and filled with soft serve in flavours like pandan, matcha or vanilla with tons of topping options. May have dairy-free flavour depending in what flavours are currently on offer. 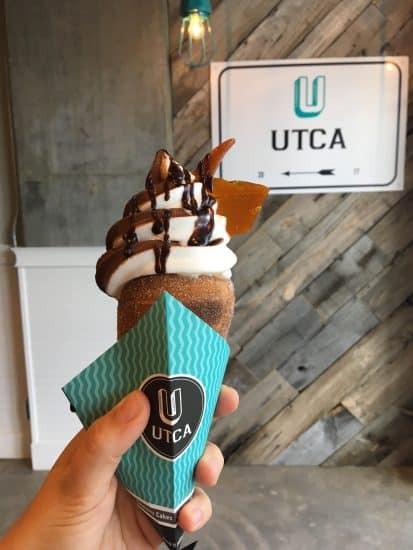 At Utca, you can get tubular Hungarian Chimney Cakes filled with soft serve and lots of topping options. 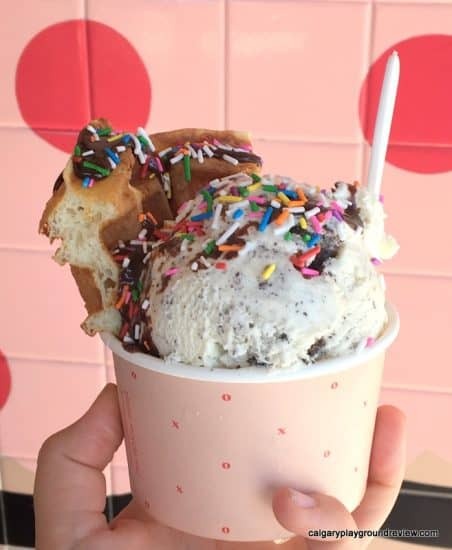 You can also get a sundae in a cup instead. 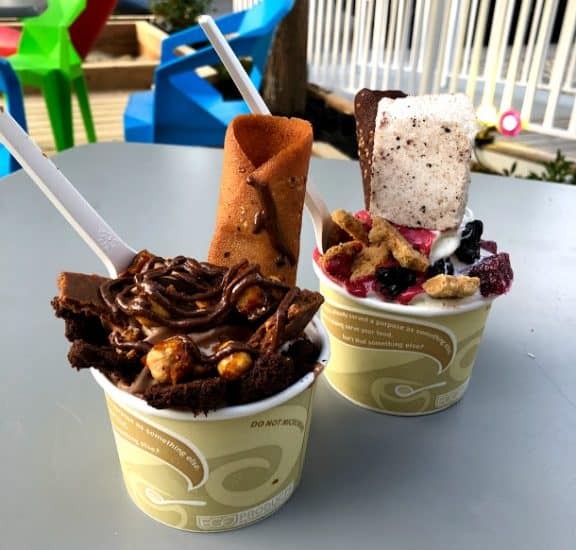 Special diet options: The chocolate soft serve is dairy-free and the chimney cake recipe is vegan. You can also find Lukes ice cream in the internal cafe in the new Central Library. This drug mart, unlike any other, now offers two flavours of soft serve ice cream at their coffee bar just inside the front door. They plan to create unique seasonal flavours and create their soft serve from scratch using milk from D Dutchmen Dairy in BC. 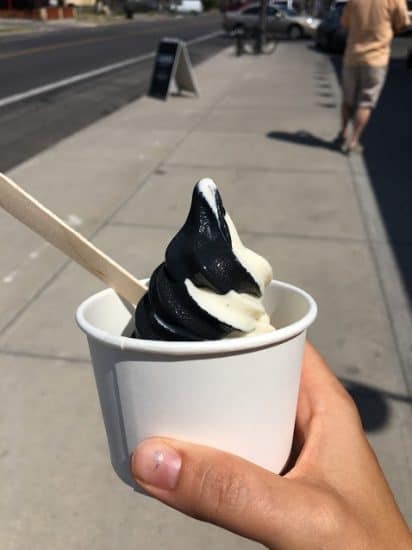 They serve one size and have started with coconut charcoal and vanilla which you can get alone or in a swirl of both. 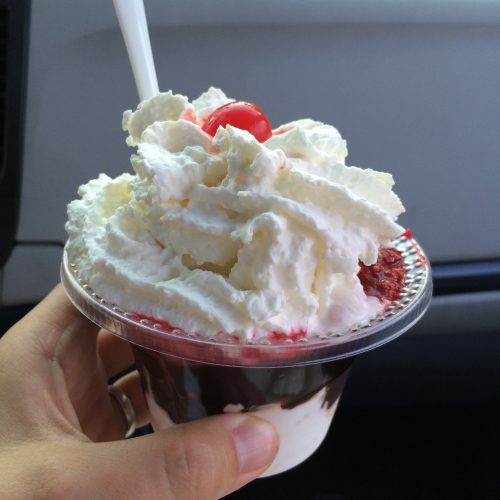 Peter’s is better known for their milkshakes but they also offer soft serve ice cream, sundaes and banana splits. They will let you put more than one flavor on your sundae at no extra charge. 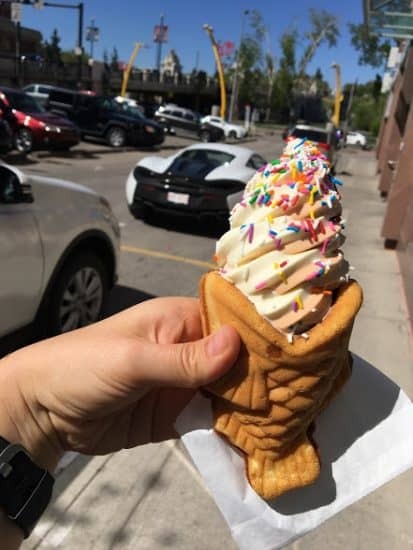 One of Calgary’s newest ice cream shops, Berlingo is brought to you by the same people who run Yann Haute Patisserie. They ofer soft serve with flavours like pineapple-lime, mango-passion, cocolate, hazelnut, and raspberry cheery. (swirl combinations also available). Chef designed sundaes such as choco-hazel, vanilla bean-berry, chocolate cheese cake. Special diet options: vegan soft serve sorbet options (vegan flavors are also nut free). This Montreal based chain has now expanded into Calgary. They specialize in flavoured Belgian chocolate dipped soft serve ice cream covered in toppings. Vegan options available. Offering 8 options of rolled ice cream with lots of possibly toppings. Flavours include Mango Monsoon, Boom Chocolate, Lychee Berry and Cookies n’ Cream. Large and small sizes available. Special diet options: Nut free. No non-dairy options at this time. 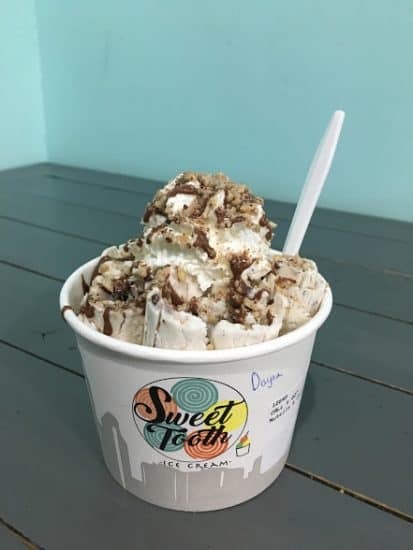 Sweet Tooth Ice Cream offers Thai style rolled ice cream made right in front of you with liquid nitrogen. They have 7 different flavours with lots of toppings. 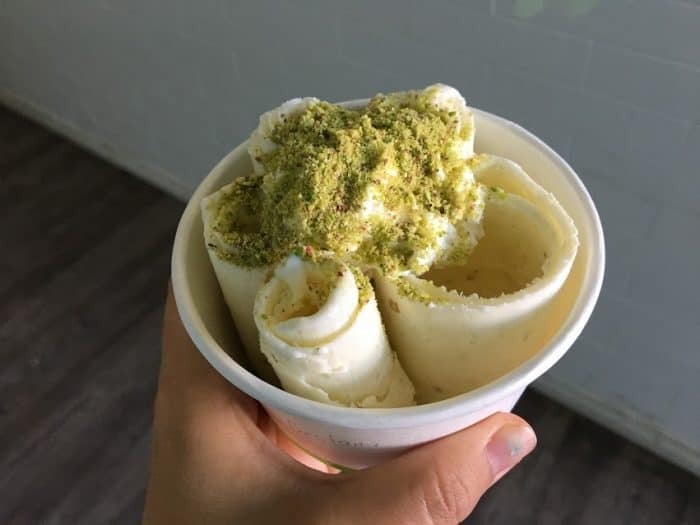 Scrollio offers Thai-style rolled ice cream. You can get one of three bases – vanilla, chocolate and a vegan coconut base. Their menu includes different signature combinations, but you are welcome to change them around to make them your own. 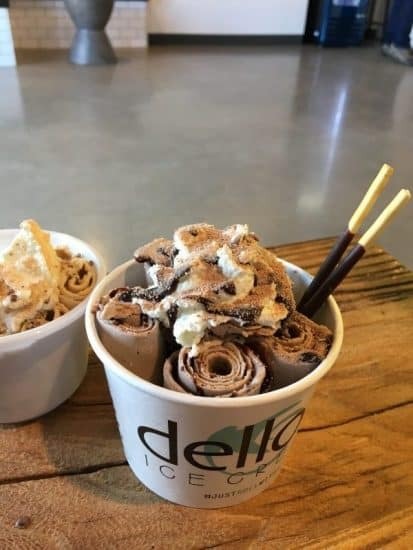 The ice cream rolls are created right in front of you, which is pretty cool, but not the quickest way to get your ice cream fix. 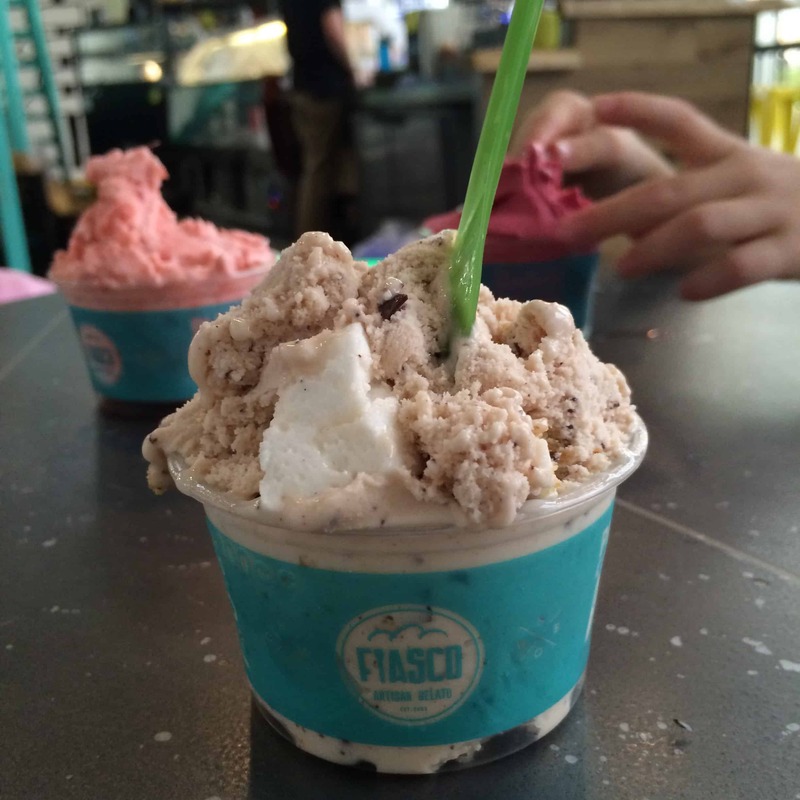 Fiasco Gelato’s new headquarters serves ice cream by the scoop. They offer creative flavours of Italian gelato and dairy-free sorbetto as well as ice cream sandwiches. 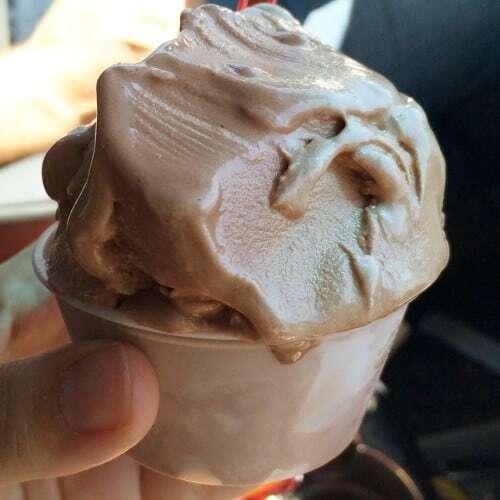 Not only does Burger 320 have some of the best burgers in the city, they also make their own gelato. Their flavors change daily and you can get your gelato in a cone, dish or made into a milkshake. They also have a selection of Family Freezed popsicles. 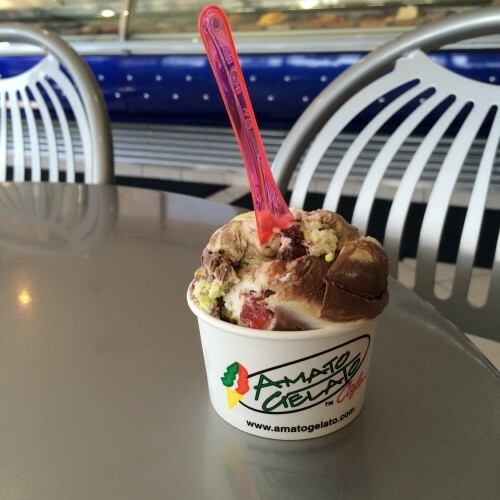 Amato Gelato specializes in Mario’s Gelati traditional Italian ice cream. It is hands down the best place in Calgary for the most dairy free and Italian gelato flavours. Special diet options: tofulati (made with soy), many non-dariy sorbetto options, no sugar added ice cream. 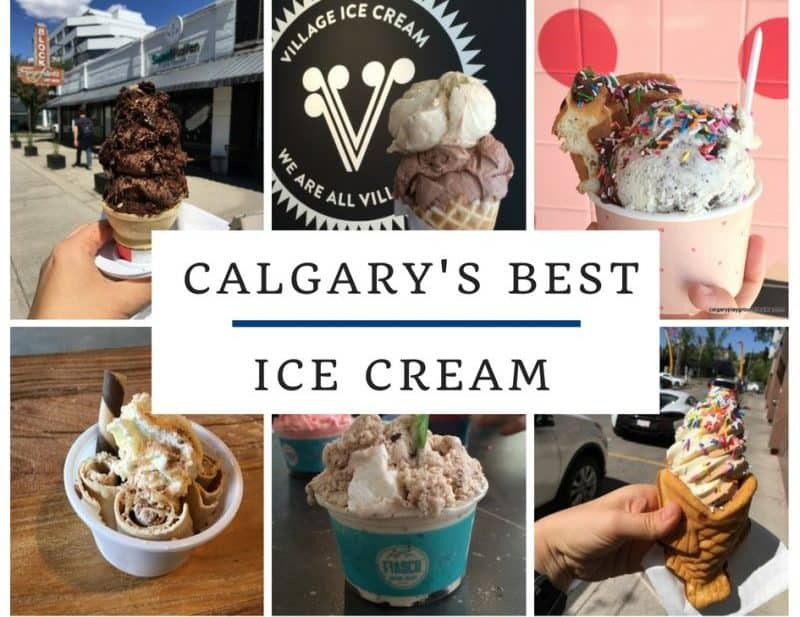 When I was asking for recommendations for the best ice cream in Calgary, Village Ice Cream was the most frequent and most enthusiastic response. 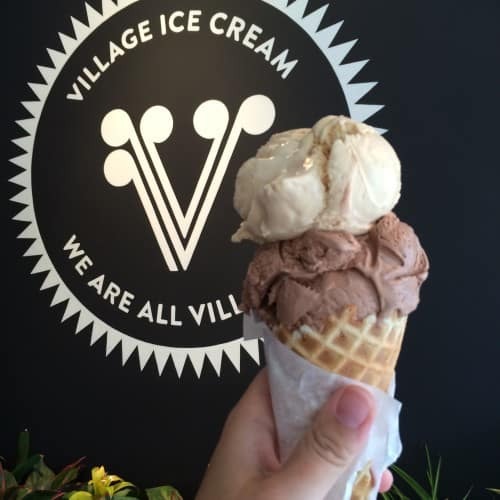 They make their own small batch ice cream with high quality, local, seasonal and often organic ingredients. They have 10 flavors always available plus a few seasonal flavors as well. They have some classic flavours like chocolate, strawberry and vanilla as well as innovative artisanal flavours like salted caramel, earl grey tea and cardamom. Special diet options: Dairy free sorbet and dairy-free coconut milk ice cream. Made By Marcus has been available in specialty grocery stores for a while but now you can find them at their very own location. They offer artisanal small batch hard ice cream flavours as well as soft serve ice cream sundaes. Offers small batch, traditional and seasonal flavours in a modern interpretation of a mom and pop shop. Lic’s has been serving ice cream in Calgary for 33 years. It’s location makes it a perfect place to stop for a cone and a walk along the Bow River. They have lots of flavours and if you order a double, you even get a double cone! 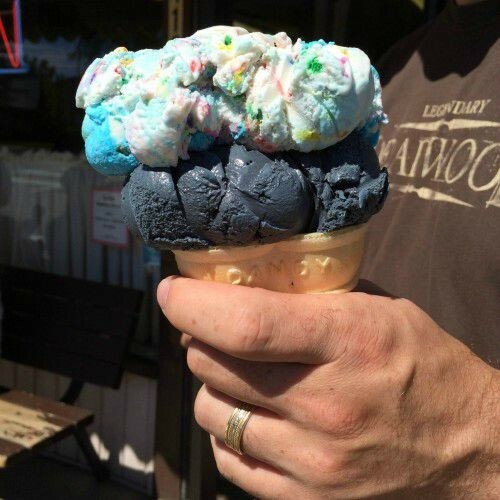 My Favourite Ice Cream Shoppe now has two locations – it’s orginal Altadore location has been around since 1981. They atmosphere has a retro-dive feel but their selection (primarily Foothills Creamery) is huge. Purdy’s is a regional chain that started in Vancouver. Purdy’s typically offers a selection of around 8 of their own flavors as well as sundaes and ice cream bars. Their sundaes are topped with Purdy’s melted chocolate and either with sprinkles or toasted nuts. The ice cream bars get dipped right in front of you. 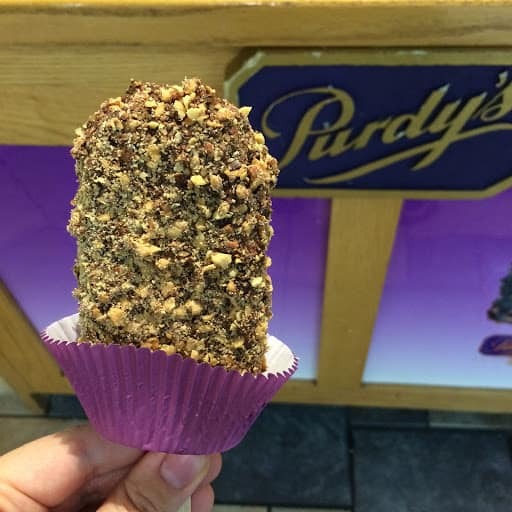 If you really want to do it right, get Purdy’s Ultimate Ice Cream bar – a vanilla ice cream bar that is first dipped in white chocolate, then dark chocolate and finally covered in toasted almonds or sprinkles right in front of you. A couple more are Marble Slab, and Purdy’s, Rocky Mountain Chocolate Factory, Laura Secord etc. They all have delicious ice cream. 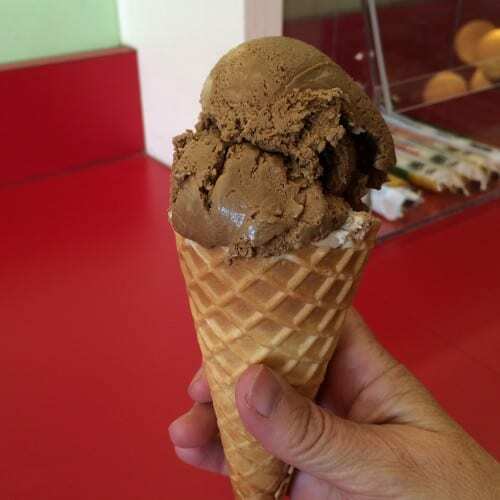 Missing the Bragg Creek ice cream store… can’t remember the name, but it’s hard to miss it when you go to Bragg Creek or on the way back from the Elbow Falls, lol! You are absolutely right, I completely missed it! I’ve added it in now. Love all the recommended places! Hi BW, you are correct that the Sorbets they used to have had non-fat skim milk. I actually e-mailed them about it because the information on their website and in store differed. They told me that they were switching from their 1% dairy milk sorbet to dairy-free. It would be helpful if their online information was up to date but I know this often lags behind. i would highly recommend double checking if this is an issue for you to be sure though. 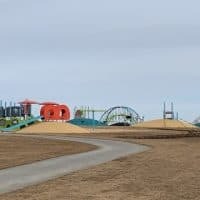 Good to hear that they are finally changing it! Thanks! Oh my goodness! I clicked on the link and then proceeded to tell my husband about growing up in Medicine Hat with Swirls. They had the creamiest dreamiest soft serve ice ever had. Craving it now! Big Moo in Sylvan Lake. It’s right across the road from the beach, and has been serving great Ice Cream (Foothills, I think) for as long as I can remember. I’m surprised Chinook Honey Company’s ice cream didn’t make the list, they have the BEST honey-based ice-cream ever!! I had no idea! Added now! Can’t forget Marvs Classic Soda Shop in Black Diamond. Lic’s is so incredibly overpriced. We love to complain about gas prices, but based on the line-ups here, no one cares, and it allows them to charge what they want. I believe Marcus and Village are far higher on the quality spectrum yet quite a bit lower on the price. I would’ve left but we wanted a treat after a 5 hour hike and I didn’t want to disappoint my friend. What on earth is a double baby cone….let’s not get too creative here! A baby cone is $3.50, a double baby (2 flavours) is ~$5.25. They probably ensure no one buys it by calling it a baby. The lineup was slow, and when I reached the front I could see how inefficiently it was being operated. Maybe they were short staffed. I can’t say this is all the time as I tend to frequent other ice cream shops. Marcus and Village can be slow as well, but I’ve found them more efficient and believe they provide better value. Always loved My Favourite Ice Cream Shoppe!